The new Windows Workflow Foundation technology that ships with .NET Framework 4 represents a major improvement in performance and developer productivity and realizes a goal of declarative application development for business logic. Windows Workflow Foundation (WF) is a Microsoft technology for defining, executing, and managing workflows. This technology was first released in November 2006 as a part of .NET Framework 3.0. The current version (4.0) was released as part of the .NET Framework 4.0. The major refinement of the new version is the tighter integration of WF with Windows Communication Foundation. As software developers know, writing applications can be challenging, and we are constantly looking for tools and frameworks to simplify the process and help us focus on the business challenges we are trying to solve. Microsoft help to moved from writing code in machine languages such as assembler to higher level languages like C# and Visual Basic that ease our development, remove lower level concerns such as memory management, and increase our productivity as developers. .NET allows the Common Language Runtime (CLR) to allocate memory, cleanup unneeded objects and handle low level constructs like pointers. To determine the performance, I used the Instrumentation Profiler. 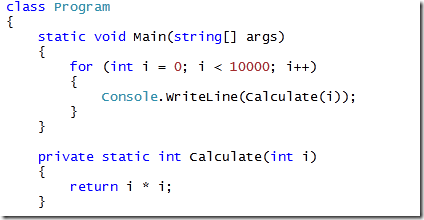 The simple C# code took approximately 800 milliseconds to execute. Most of the time was spent writing to the console. Some example flowchart sample using wf4. But if we really think about what’s happening here, this performance isn’t that bad. We know that it takes about 1 second to perform the calculations and output the results. That means that the remaining 35 seconds was spent on “workflow” related processing. In that 35 seconds, we were able to create and execute 10,000 workflows. Clearly this is not fast enough to accomplish. 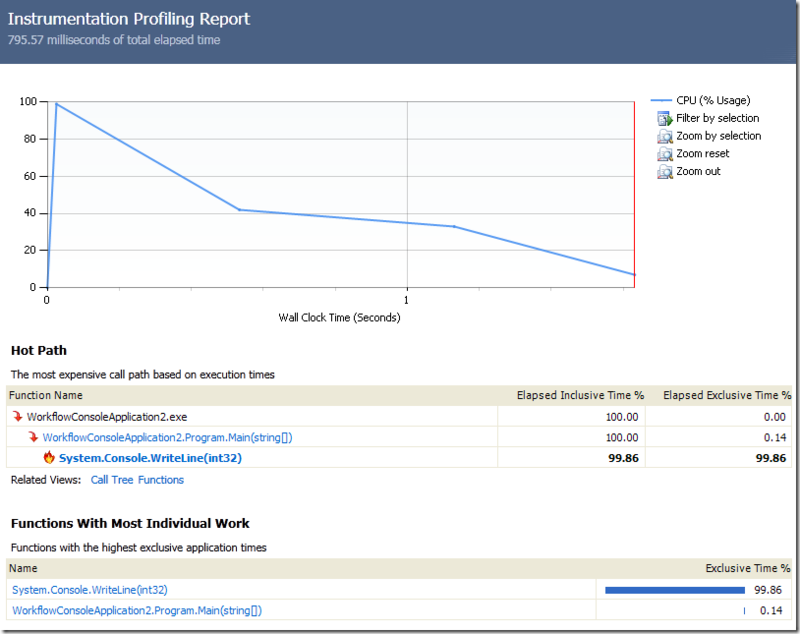 After digging through the profiler, we can notice that the application seemed to be spending a large percentage of the time initializing the workflow. This led me to investigate if we could just create the workflow object one time and reuse it whenever we invoke that workflow. It turns out that we can, and the results are dramatic. Notice that I am now passing the input to the workflow using a Dictionary<string,object>. I’m not sure why, but when I tried setting the input using workflow.y = i, the workflow would always use the first value that was assigned to y. In this case, my output was always 0 because the workflow was always using y=0. Passing the workflow inputs as a Dictionary seems to work around this problem. Using this method of invoking the workflow, the total execution time was just over 1.15 seconds. Now this looks much better. By caching the instance of the workflow object, we are able to significantly reduce the overhead of executing a workflow. In this case, we spent just over 1/2 the time calling Console.WriteLine(). That means we were able to execute 10,000 workflows in the remaining .65 seconds. Considering the flexibility this can provide in an application, I would consider this overhead to be minimal. In most real-world applications, the difference in performance will not be noticeable to the end user. When running the application in release mode with no profiler attached, it took 14.48 seconds to execute the workflow 1,000,000 times. That works out to 69,039 workflows per second! 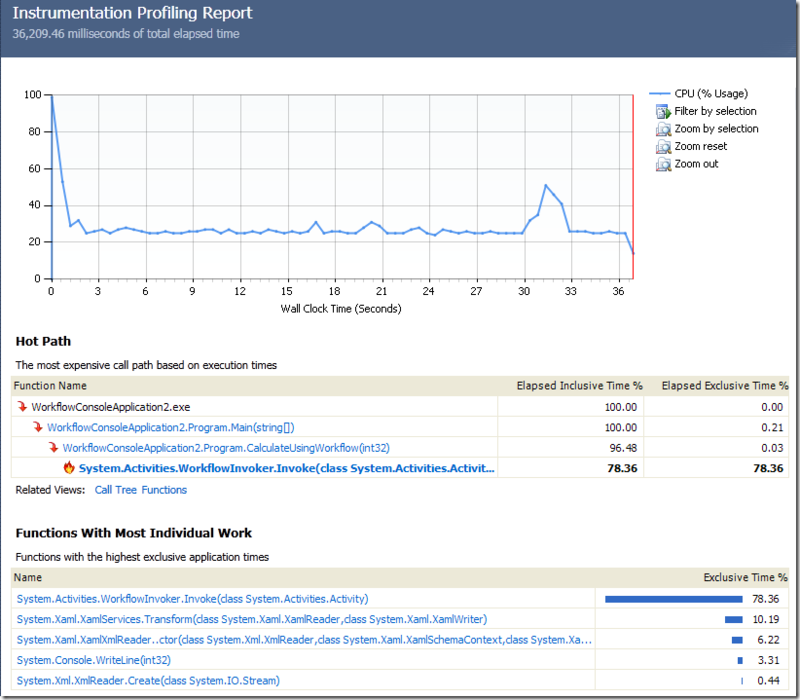 Performance profiler in VS 2010 to be useful. While it is much better than no profiler at all, I was a little disappointed. There are much better profilers on the market today. Before I continue, it is important to understand that backwards compatibility was also a key goal in this release. The new framework components are found primarily in the System.Activities. * assemblies while the backwards compatible framework components are found in the System.Workflow. * assemblies. The System.Workflow. * assemblies are part of the .NET Framework 4 and provide complete backward compatibility so you can migrate your application to .NET 4 with no changes to your workflow code. Throughout this paper I will use the name WF4 to refer to the new components found in the System.Activities. * assemblies and WF3 to refer to the components found in the System.Workflow. * assemblies. 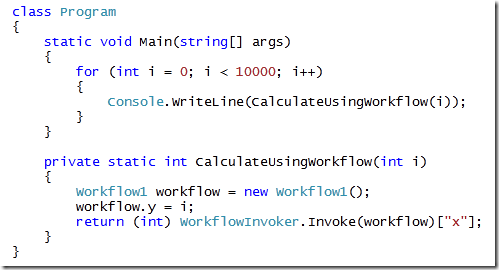 Workflow Foundation (WF) in .NET 4 - provides the declarative framework for building application and service logic and gives developers a higher level language for handling asynchronous, parallel tasks and other complex processing. Much of the complexity of an application lives in the logic and processing that goes on behind the scenes. Issues such as asynchronous or parallel execution and generally coordinating the tasks to respond to user requests or service requests can quickly lead application developers back down into the low level coding of handles, callbacks, synchronization etc. 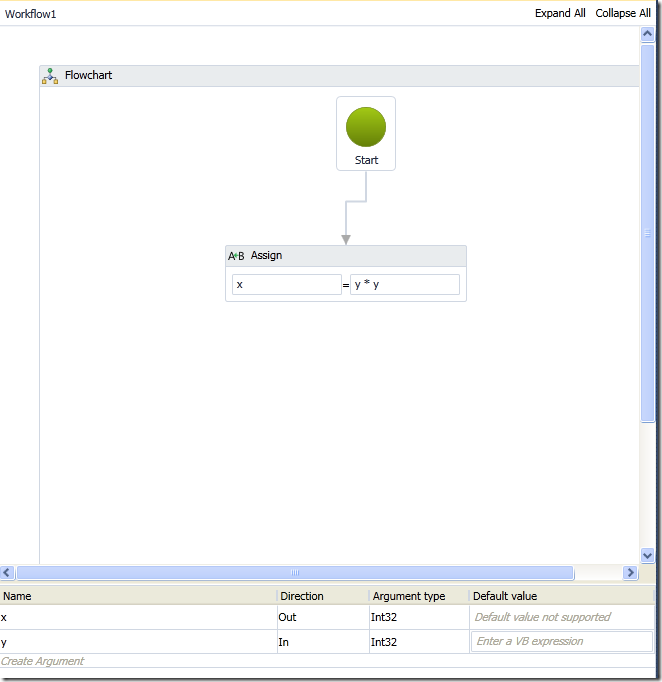 We discuss flowchart sample using wf4. As developers, we need the same power and flexibility of a declarative programming model for the internals of an application as we have for the user interface in Windows Presentation Foundation (WPF). What does Workflow Foundation (WF) mean to you? Workflow Foundation is something like Biztalk. Have you ever used Windows Worflow Foundation or Biztalk? A post with illustration is a good demonstration. Keep posting with an illustration and your visitors will back and read. Now this is what I mean a great blog. I enjoy your article very much. I hadn't given thoguht to before . Now lets see if I can do something with it.